Chrysolasia guatemalena (Distant, 1883) is a cicada found in Guatemala. Special note: this cicada might be related to the Magiciada (17/13 year cicadas) cicadas found in the U.S.
Chrysolasia guatemalena was formerly known as Tibicen guatemalenus. 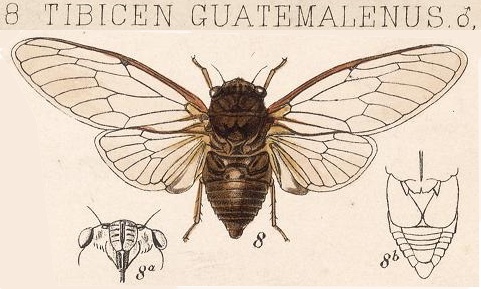 The image says Tibicen guatemalenus, but its newest name is Chrysolasia guatemalena. Obscure castaneous, somewhat thickly covered with ochraceous pilosity. Area of the ocelli, a central fascia to pronotum (which is ampliated and produced on each side at anterior and posterior margins), some obscure and irregular spots on mesonotum with cruciform elevation at base, and abdomen above fuscous. Body beneath much paler and very densely pilose; head, sternum, and opercula ashy grey; abdomen pale ochraceous. Tegmina pale hyaline; costal membrane, basal area, and claval base pale castaneous; veins pale fuscous. Wings pale hyaline ; veins and suffusion at abdominal area pale fuscous. Head, including outer margin of eyes, broader than pronotum; face with a broad central longitudinal sulcation and somewhat faintly transversely striate; rostrum not quite reaching posterior coxae; opercula reaching base of second abdominal segment, narrowest at base, with the outer margins truncate, widened and rounded posteriorly, but not quite meeting inwardly. Long. 20 millim., exp. tegm. 57 millim. The illustration, location and description comes from Biologia Centrali-Americana. Insecta. Rhynchota. Hemiptera-Homoptera. Vol. 1. By W. L. Distant F.E.S. and The Rev. Canon W. W. Fowler, F.L.S. (1881-1905). Read it on the Biodiversity Heritage Library website.